You want to layout the pattern on your pants. For example, if you are using a large flower, layout out several copies of the flower so you can make sure it fits well on the pants. You need to know where each flower is going to go before you start with the permanent marker. Note: If you are only doing one leg, do the right leg. This is the leg people will see when you go through the arena to do your queen wave. With a permanent marker, draw or trace your pattern. You need to find colors to make the colors in your shirts. Always shake your paints well before starting. To mix paints start with your base color and slowly add in the other color until it matches your shirt. Make sure that you stir your colors really well. 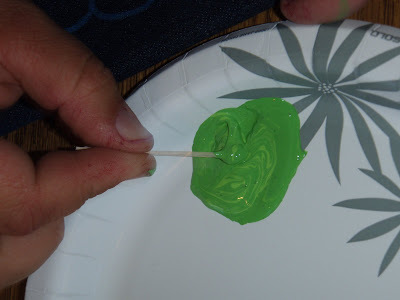 Paint Tips: If the paint is too thin, pour some out and let it air dry. If it is too thick, you can add water to it. Once you have the color you need, you can start to paint. You should start from the bottom and work up. Also start from the center, go to the outside, and fill in the rest. It may take 2 coats. So be sure to let the first coat dry completely. If you are paints a thin shirt to match, be sure to put some cardboard under it. Be sure to get a lot of paint in the seam. 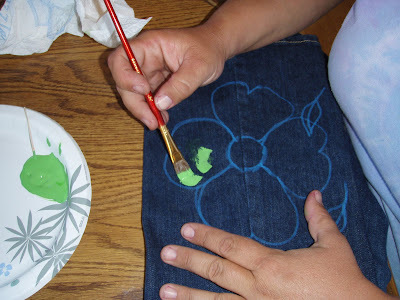 You can use dimensional fabric paint to give added interest to your painting. With dimensional paint, do not brush. You can also use glitter gel. 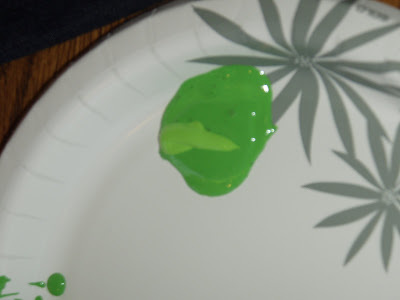 Be sure to get some gel coming out of the tip before you try to apply to pants. Glitter can be used. 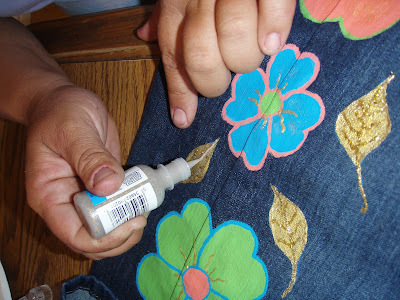 You can put fabric glue and then put glitter over it. Be sure to let the glue dry completely. Then shake off the excess glitter. We will do another post about additional embellishments. Let the paint dry for 24 hours. 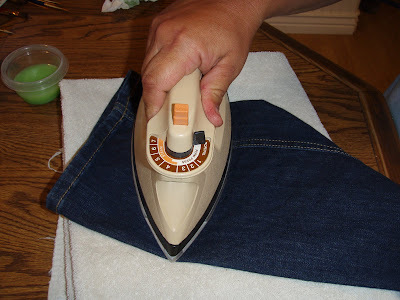 Then iron the pants to seal the paint. It does not have to be perfect. No one will be that close. 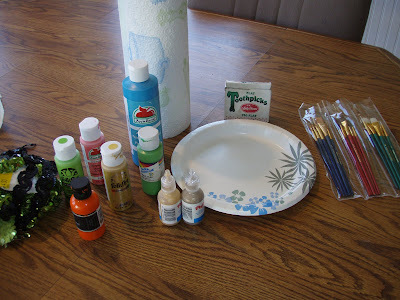 If you can find textile medium, add it to the acrylic paint. It makes blending easier. Acrylic paint will work without it. 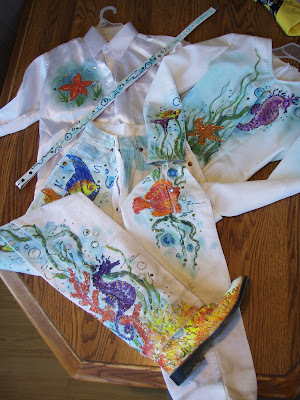 There are a lot of things you can do with an ordinary pair of jeans when you are competing in a Rodeo Queen Contest. 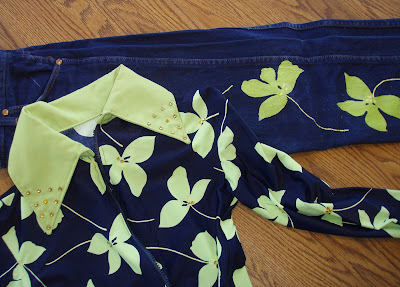 You can take a fantastic shirt and paint some jeans to complete an outfit. It is a lot less expensive than buying a full Rodeo Queen outfit. You don’t have to spend a fortune to look amazing! 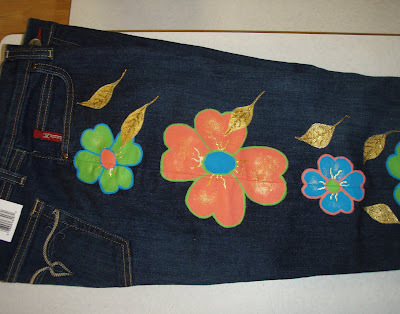 Here are some great examples of pants that were painted to match their tops. 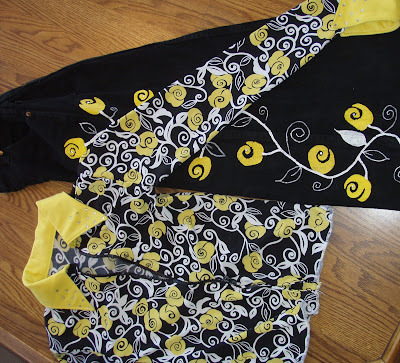 Here is a great pair of black jean painted to match a black top. 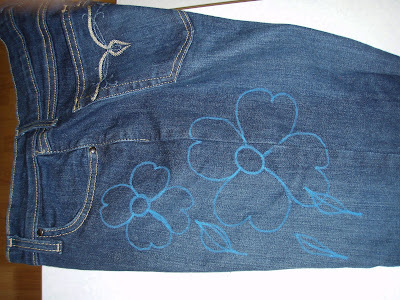 Here the leaf pattern is just painted on some regular blue wranglers. Here is a pair that was painted free hand for Hawaiin night. Here is one that got out of control. Painting paints, shirt, boots and belt to match. 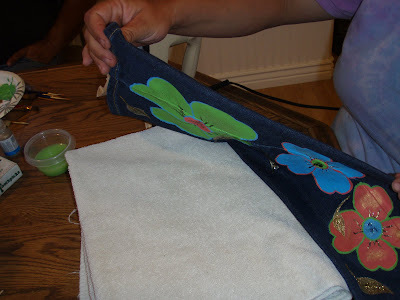 Look for the next post for the step by step to painting jeans. Girth itch is another member of the ringworm family. It is spread through contact with contaminated tack, grooming supplies, and environments; is highly contagious. Tack friction also plays a role in the cause of this fungus. It appears as clusters of small hairless circles, one quarter to one inch across, covered with tiny scales in the girth or rein area. These may balloon into larger barren patches or may form crusts as the surrounding hair falls out in clouds of dandruff. Though not painful, this condition is often mildly to tremendously itchy. Treatment for girth itch is identical to that for other ringworm infections. Early this summer when we contacted this fungus we immediately started using a fungus spray that you can find at this website, http://www.horse.com/Fungasol-Spray-BKA11.html enter this code at check out CULBR. We have learned that living in Utah our cinches get sweaty and then because of the moist, mucky conditions from riding in the winter months this causes a fungus in your cinches. Because it is cold they never get a chance to dry out like they do in the summer time. So we have learned that you need to try and keep things as clean and dry as possible. Also sharing tack as mentioned above can be a problem so try and eliminate this if possible. Spring cleaning of tack and grooming supplies can help eliminate this fungus from your herd. http://www.horse.com/EZ-ALL-MULTIPURPOSE-CLEANER-BRC41.html use this code at check out CULBR. A lot of us have our kids "ground or dummy rope." Most of the time it works out really well. The main thing to remember when they ground rope is that they need to be standing on a bucket, a cooler, a bale of hay, or anything that elevates them. 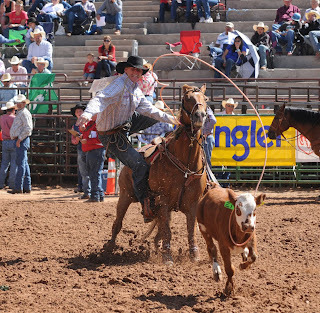 The angle of the loop is closer to that of roping off a horse. 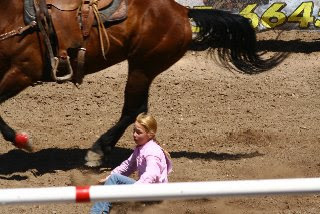 If they rope standing on the ground, the angle of the rope is different and they won't be able to catch when they are on a horse. 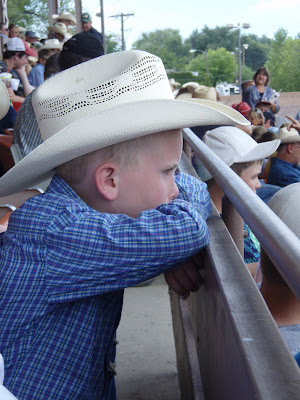 Looking out over the arena at the National Little Britches Rodeo Finals. Thinking that will be me in that arena next year. 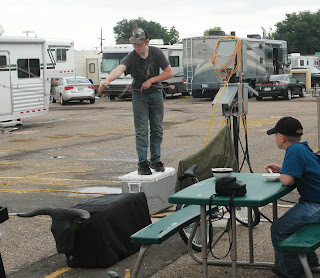 A lot of effort goes into preparing for a rodeo. Practice, caring for the animals, packing, traveling..... the list goes on and on. One thing that is just as important as all of the above is visualization. When you get to rodeo you also need to mentally prepare yourself just before the event. It’s ok to socialize but not right before the event. You need to visualize and mentally prepare yourself for the event and all the different things that can happen. So when you go into the box you are calm and ready for that event. 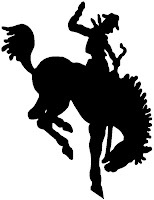 The classic cowboy event. 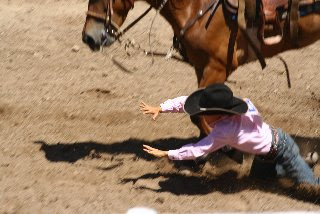 What a great shot from the Little Britches National Finals! One of the most important things you can do for barrels and poles is LOOK. The idea behind LOOKING is that you look with your entire body. When you shape your body as if your eyes were in your shoulders a number of things occur. Your shoulders are rotated in the direction of the turn. Your hands follow your shoulders and are in the most effective position to control the horse. Your weight is shifted on your seat bones and they move in the saddle in a way the horse can feel. Then if you notice your inside leg becomes active at the cinch, making it easy for you to ask for flexion. Your outside leg is in a great position to apply holding control to the hindquarters. You need to practice this at a walk, trot, and lope, this trains you and your horse to communicate. 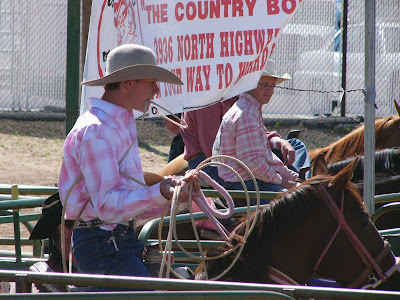 In barrels and poles we tend to want to go fast but just as a roper must rope the dummy for accuracy a barrel racer and pole bender must slow things down and gain accuracy before asking for more speed. I would also recommend using other things such as cones, (My favorite) sage brush in an open field. 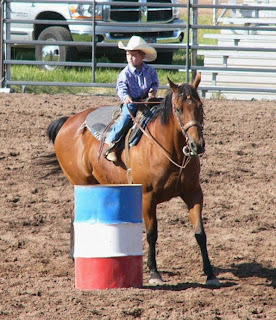 You can teach the same things as you can using a barrel and pole and your horse doesn’t associate it to just that event. This opens up better communication because he knows that when you LOOK know matter where or when he is expected to follow your lead. Communication is the key ingredient for running poles successfully. Because you are human and will not be in perfect position every time. By communicating to your horse what is expected of him, hopefully he can compensate for your mistakes and you can compensate for his mistakes. Consistent communication is the secret to success in pole bending. 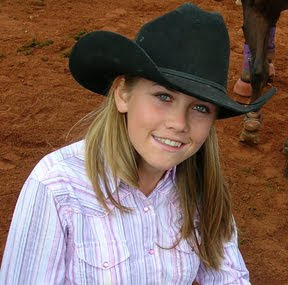 We were traveling to the Little Britches National Final Rodeo in Pueblo, CO. My 17 year old daughter was reflecting on our year and what it took to get here. She came to a very interesting conclusion. She said "mom you know rodeo make no sense right." I said "why?" She said "we work so hard. We spend hours and hours practicing each week. We go to a rodeo and spend 3 to 4 hours. And what do we do all of that work for a 21 second pole run, a 16 second barrel run and a 4 second breakaway run. 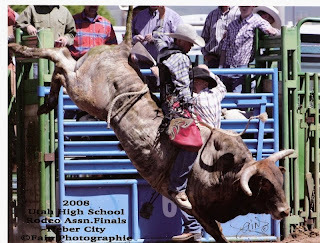 The total time I spend in the arena competing is less than a minute at a rodeo!" Rodeo really is a crazy event but I had never thought of it that way. "Dreams and dedication are a powerful combination." 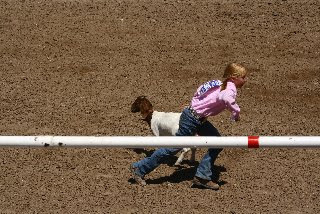 I am sure the next generation National Finals Rodeo qualifiers are in this bunch of cute kids! 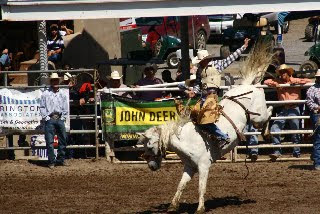 We were at a rodeo in Pueblo, CO. While visiting with a gentleman there, he had a very interesting view on goat tying. He said goats. Isn’t that where those tiny little girls are riding the biggest horses they can find. They run those big horses as fast as they can down the arena. Jump off and/or rather fall off. We are a unique breed building tough kids.